Within the closing hours of their Kickstarter campaign, 2Awesome Studio received a generous pledge of €7,000 leaving them just slightly short of the €30,000 target that Dimension Drive needed. The developer, of course, couldn’t believe their luck, especially due to the fact that, as a last-ditch effort, they decided to stream the whole final stretch of the campaign live on Twitch. During a period of high spirits and celebrations, one of the developers on the team received a message from Kickstarter informing them that they have actually been trolled under a fraudulent account. As you could imagine, this instantly crushed the mood of the creators, and the target was unfortunately never met. However, they did go at it again, and, as news got out on what happened, they managed to raise around €42,000 for the project. This became a great end to an unfortunate double turn of events because, as it turns out, Dimension Drive is actually a solid title with a very interesting premise. The first thing that screamed out to me when I got wind of this scrolling arcade shooter was Ikaruga, and not necessarily because both games have a unique take on the genre or even any visual similarities as such. It was more due to the incredible YouTube videos of a Japanese wizard working through the multiplayer of the colour-swapping, bullet-hell shooter by himself. You see, Dimension Drive is no ordinary top-down space blaster, because not only do you play through two separate versions of the same level, you also have to play them both at the same time. You play as Jackelyne Tywood, a prodigy space pilot seeking revenge against the evil Ashajuls army and their leader Nies. You take control of a ship called the Manticore – the only spacecraft capable to teleport between dimensions outside the enemy’s technology. The story itself gives you motive to the action but, in all honesty, I really didn’t care much for it. I found the whole thing a bit generic and corny in parts which slightly pulled me out of the experience. The comic-book artwork that accompanies the narrative never quite hit the mark for me either, although I did like the character design of Jack herself. Thankfully, you are not forced to watch the story unfold as everything is easily skippable. You can even turn it off altogether in the options if you have no interest in it whatsoever. Of course, most games of this ilk aren’t exactly known for their groundbreaking storytelling so it’s a good job that the gameplay itself delivers. What separates Dimension Drive from most others is the dimensional teleportation mechanic that this title so heavily relies on. You have two screens scrolling parallel to each other of which you hop between with a press of a button. If your ship is on the left screen, a red glow moves on the right in unison indicating your position in the absence of your ship. You take advantage of this skill to avoid blocked paths on one dimension to find open space on the other. It works both as a defensive tool and a method of attack as you dodge enemies to catch a breather or extend your multiplier combo scores when on the hunt. The whole mechanic can seem a bit overwhelming at first, especially when you warp straight into walls on the other side, as the environments will instantly kill you. Eventually, with a bit of experience, you begin to understand the patterns and begin to take full advantage of the feature. As you venture on, you gain new navigational abilities such as turning your ship around to slow down the scrolling pace of movement as well as a lateral dash to zip in and out of tight cavities. Again, this throws another spanner into the works at first because suddenly you have even more balls to juggle with. Coordination and multitasking is key along with breaking and forming new habits to make it all gel together. With a bit of mental conditioning though, I soon began to feel like a multidimensional Jedi. What does help ease the confusion of the mechanics is down to how short the levels are. They are quite easy to learn as a result and depending on the difficulty you choose, the more leeway you have for small errors. Take the normal difficulty, for example, and you have four shields of damage that can regenerate over time or are collectable within the stages. You also have three lives per level allowing you to maintain your checkpoints in the event of losing a ship. The higher difficulties modes raise the handicap by taking some of these crutches out of play, and for the complete show-off, there’s even a one credit, no continue option to test your tolerance. Your weapon has an energy meter that, when spent, encourages you to swap screens in order to recharge them. Collectibles known as data cubes can be found within each level and as a primary function, they are used to unlock new weapons for your gunship. However, I did favour the default weapon over the unlockables as they just didn’t feel nearly as good as your stock cannon. The data cubes also unlock something when all four on each stage are obtained, but if truth be told, no matter what I did, I just could never find the last cube in any level to see what they actually unlock in the V.E.R.A options of the main menu. 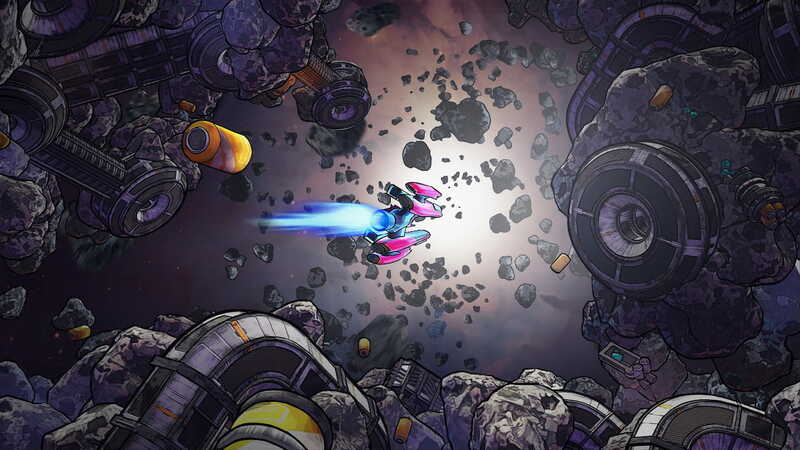 The gameplay itself felt fair, and not quite as hectic as your average bullet-hell shooter. The controls feel fluid, placements of objects and enemies seem well thought out and the bosses brought some interesting fights to the table. However, I did feel very underwhelmed with the final battle, it just drags on too long due to its pacing, especially when you have learned most of its patterns only to get instantly taken out at the final transition of attacks. It’s not a whine against the difficulty, I assure you. It just felt like a slog to get to that point, especially considering the more interesting encounters leading up to it. There is an additional multiplayer co-op feature to fight alongside your wingman. All your vitality is shared with your partner to encourage teamwork and the enemies take a bit more of a beating to take down. Your ammo energy does slowly replenish, allowing you to occupy your own screen longer than you are able to in single player. Whilst it works fine enough in the earlier stages, as the difficulty ramps up and your new mechanics come into play it soon becomes a bit of a convoluted mess. The experience feels much more manageable as a solo adventure and if you and a friend aren’t as in sync as the Cheeky Girls you will probably dive much faster than their career did. One thing that bothered me more than anything, was regardless of what rank I achieved, it would always save as a C rank on the selection screen. This could very well be a bug that will soon be patched in, but it is annoying none the less when I got a big, “A rank” achievement plastered at the end of the level. There’s also no online leaderboards that were advertised as part of keeping the replayability fresh, along with other modes promised within the developer’s pledge to keep the fire burning. In fact, the only extra mode that seemed to be added is a Mirror Game+ mode once you beat the game. Again, hopefully, these features will be patched in the near future, but only time will tell. The graphics fit well enough to keep the momentum flowing, with a smooth frame rate and next to no slowdown in my experience. Granted, the visuals are not exactly the selling point of the title and if it wasn’t for the split-screen mechanic, it could easily get lost in the crowd. The music does work very well with the gameplay with catchy tracks and sound effects that stay true to its arcade vibes. Dimension Drive takes an interesting concept and implements it well to separate itself from the many other shooters out there. The split gameplay mechanics may be a bit too much for the majority of the casual market, but anyone with a bit of thirst for a challenge could quite easily get to grips with its structure. It feels a bit like a fast-moving Tetris run at times, creating a somewhat puzzle element within its core when swapping between screens in the more maze-like sections of the game. It’s also very well priced for what it is, and more importantly, it plays considerably well as a portable time killer.